With over 40 active NFL players and some of the world’s biggest celebrities, Bullseye’s 2019 Players Tailgate, rated the #1 event Super Bowl weekend in Houston (2017) and Minneapolis (2018), promises to be the biggest and best pre-game event in Atlanta ahead of Super Bowl 53 in 2019. Fieri once again returns to create the VIP menu, joined by the greatest caterer in America, chef Aaron May, and a team of celebrity chefs hand-selected by Fieri himself. 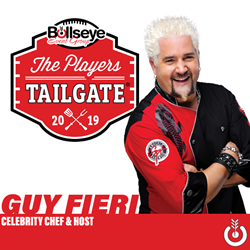 Bullseye Event Group is excited to announce the return of celebrity chef Guy Fieri as the host for the 2019 Players Tailgate at Super Bowl 53 in Atlanta, Georgia! The most recognizable chef in America, Fieri can be seen almost every day on Food Network, featuring shows such as Diners, Drive-Ins and Dives, Guy’s Grocery Games, Guy’s Big Project, Guy’s Big Bite and more. Fieri once again returns to create the VIP menu, joined by the greatest caterer in America, chef Aaron May, and a team of celebrity chefs hand-selected by Fieri himself, and will be on-hand to not only provide this culinary experience of a lifetime, but to hang out and meet all VIP guests at the 2019 Players Tailgate. The menu is still in the works and will be released in the near future on BullseyeEventGroup.com. In recent years, the Players Tailgate party at the Super Bowl has earned a reputation of hosting some of the biggest celebrities in the industry, including 2016 emcee Erin Andrews, Victoria’s Secret model Adriana Lima, world-renowned tennis pro Caroline Wozniacki, the Zac Brown Band and Super Bowl champions and perennial Pro Bowl players of the past and present. Tickets to the 2019 Players Tailgate at Super Bowl 53 in Atlanta can be purchased directly from BullseyeEventGroup.com, or are included in all of Bullseye’s Super Bowl 53 Travel Packages. Bullseye Event Group’s Super Bowl 53 Travel Packages offer fans the chance to cross the NFL’s biggest game off their bucket list, without handling any of the logistics! A VIP experience throughout Super Bowl weekend in Atlanta includes some of the most luxurious hotels in the Atlanta area! Super Bowl 53 travel packages also include entrance into a Super Bowl welcome reception (featuring food, a premium open bar and a live DJ), a ticket to Super Bowl 53 at Mercedes-Benz Stadium, private motor coach transportation to and from the stadium on game day and entrance into Bullseye’s 2019 Players Tailgate at Super Bowl 53. Call Bullseye Event Group today at 317-800-5820 for pricing and insider information regarding the Super Bowl 53 Travel Packages and the 2019 Players Tailgate at Super Bowl 53! The official events, travel and hospitality partners of the Indianapolis Colts (NFL), Detroit Lions (NFL) and New Orleans Pelicans (NBA), Bullseye Event Group has earned a reputation as being an industry leader in event hospitality prior to some of the biggest sporting events in the United States. Bullseye Event Group is also the exclusive hospitality partner of StubHub Live. Best described as “culinary events,” Bullseye’s official VIP events offer the opportunity to both see and be seen by some of the biggest names in the entertainment and sporting industries. Bullseye Event Group offers fans VIP experiences as a secure, official source of travel, hotel, pre-game parties and game tickets. Bullseye is a direct and dependable source for tickets to the Colts VIP Tailgate presented by Hays + Sons, Super Bowl 53 Travel Packages, the 2019 Players Tailgate at Super Bowl 53, Gate 6 Hospitality at The Masters and more. To learn more about Bullseye Event Group, visit BullseyeEventGroup.com.